-Leana: We talked a little bit about food and what food can help maybe any kid actually. - Jane: Yes, the food choices we're going to talk about today are good for any child. It's to support the developing brains. 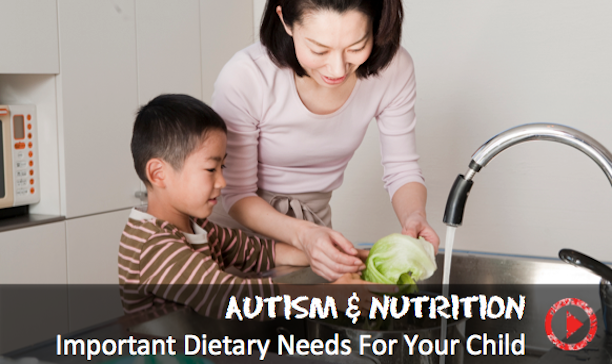 We're going to talk about ways to introduce key brain nutrients into your child's diet. - So let's see what you have. I'm going to hand them to you and you talk. - The gut flora is extremely important. We know that there are studies that show that having the wrong bacteria in your gut can cause anxiety. Having the right bacteria in your gut can help to prevent a lot of neurologic conditions. The American Psychiatric Association is now starting to introduce the gut microbiome as treatment for psychiatric disorders. - How about those little pills that you take, probiotic pills? do is because when they're living in the yogurt, they stay alive, so when they get into your gut, they're still alive. - And is this special yogurt or any yogurt? - Well, it's not just any yogurt. We have some bad yogurt choices and some good yogurt choices. Let's get out all of our yogurts because it's pretty easy to be tricked. - Okay, here's another one. - So here's one. I don't want to say anything about any brand specifically. I'm going to cover the brands, but I'm just going to show that this is a blueberry yogurt. It's low-fat, it is organic. - We're receiving no sponsorship for this brands. This is purely informative. - But I wanted to say first, it says it's organic. A parent coming into the store might think, okay, there's organic yogurt, great. - Let's move on. There's more to it than that. The fact that it's low-fat is not great for your child. They need the healthy fat for their developing brain. The fact that this is blueberry-flavored is really where the biggest problem is. The blueberry flavoring makes this have 20 grams of sugar. That's the same as half of a can of Coca-Cola. - So eating this gives you the same sugar as a half of a can of Coca-Cola. We know that the glycemic index of the food, so how quickly the body converts the food into sugar, can play a role in behavior in kids who are typically developing or have autism behaviors, can also play a role in obesity for all children. We really want to lower the glycemic index of the food that we consume which means no added sugars. - I'm showing this segment to my teenagers, by the way. It has to be organic, it should be whole milk, no low-fat, and no sugar in it, no added blueberry. - When you're going to the grocery store, you want the yogurt to be organic because you don't want the cows to have been fed hormones and antibiotics. You want the yogurt to be unflavored because you don't want sugar added, because the flavoring adds sugar, and if it's grass-fed, that's even better. That'll give some additional nutrients, and full fat of course. That's what you're looking for in a yogurt. - Black penne, I don't know how this is going to go with my kids. - Yes, well, we have two pasta types. Let's find the other one. What we're talking about now is lowering the glycemic index of the food that we eat. The reason that we want to do that is like I mentioned, the good gut bacteria is killed by sugar. It's pretty obvious how to eliminate sugar from the diet, right. You read the label. You see how much sugar is in the food. You don't eat foods that are sugar-containing foods. However, what many people don't realize is that a lot of the foods that we eat are converted by the body very quickly into sugar. For example, eating a bagel is the same as eating a candy bar. - The body converts the bagel into sugar almost just as quickly, as it would do with a candy bar. The same thing goes for pasta. Pasta is converted that quickly into sugar. Plain wheat pasta. - Whole wheat pasta is okay. - Whole wheat pasta is not even okay. Generally, whole wheat, the term if it's whole wheat, it usually doesn't really mean very much. Whole grain means something, but the term whole wheat does not really mean that much, certainly not for the glycemic index. What we want to do is do alternative grains for our pastas. These are two examples. This is buckwheat noodles. They're made entirely out of buckwheat. Buckwheat is a confusing term because it has the word wheat in it, but it actually doesn't have any wheat in it, just in the name. This is a gluten-free food. It's made out of a very healthy grain called buckwheat. We also have the buckwheat. This is the roasted buckwheat. This is another way that you can cook the buckwheat. You cook it very similarly to rice, so this would be a nice alternative to your dinner instead of rice, you cook it in water in about 10 minutes. You can put butter, olive oil in it, serve it to your kids instead of pasta or instead of rice. Now, if they're addicted to pasta, I would do one of these alternative pastas, which would be a black bean pasta. It's made completely out of black beans, so it's very high in protein, very low in its glycemic index. Same with the buckwheat, it's a very low glycemic index food. To get your kids to eat it, for those of you who are saying, no way that my kid is going to switch to this other pasta, I would try tons of butter. We have the butter that we like to use, I'm going to cover the brand because we're not advertising any brand, but we do want to use a grass-fed butter if possible. If we use a grass-fed butter, it has the healthy fats that are used by the developing brain. The other oils that you could use to cook your food would be olive oil. - You can get organic. - Organic olive oil, avocado oil, and we also have coconut oil. What these healthy fats do is that the brain cells are like an electrical wire, so they really are just transmitting electricity. You know the coating that comes on all electrical wires. The brain cells have that also. That coating is called myelin. That myelin is made out of fat, specific healthy fats. This doesn't mean that you should go out and get a bag of Doritos, because the fats that are in chips are not the right fats. However, the fats that are good for your brain come from olive oil, avocado oil, coconut oil, and specifically grass-fed dairy. Dairy, so grass-fed milk and grass-fed butter. - Cheese should be grass-fed also. Cheese should be eaten in moderation. It should never be sort of the main part of the diet. There's no reason to exclude it, but if it's grass-fed cheese, it can be used in small amounts in the diet. We're switching from pasta to roasted buckwheat, you can buy this in the bins at a lot of grocery stores, or alternative pastas. We also suggest an alternative bread that's a lower glycemic index bread. This is made out of, this specifically says low glycemic index on the top. It uses a lot of alternative grains in the bread, so it's not just wheat bread. You don't want to look for just whole wheat bread, which doesn't give you any advantage. - You have to look for the low-glycemic index. - Low glycemic index. This one is made out of barley, beans, lentils. This is a really nice bread to eat. - Pumpkin seed and hemp seed. - Quick too, you don't have to cook this. Open the package, sprinkle it onto the yogurt. These taste like nuts. - Could be a good snack too. - They don't go together. - Right, dark meat, chicken, beef, spinach. You do not want to give those foods with dairy-containing foods like milk or yogurt. You instead want to give those iron-containing foods with Vitamin C containing foods. Vitamin C helps the body to absorb iron. Vitamin C containing foods would be strawberries, oranges, bell peppers. Those are the top examples. - These seeds with bell peppers, seeds with strawberries, seeds with orange, that would be a great snack, yep. - Did we go over everything? - The one last thing is people ask me about supplements. I don't routinely suggest any supplements that are good for everybody except fish oil. I will say that fish oil is really good for the developing brain under all circumstances. The reason why is that this is exactly the fat that makes up that coating on the brain cells. The child's brain is born with huge areas of the brain without that coating, and is developing that coating really actually for the first 25 years of life. - I wish you could stop them from driving. - Impulses are not fully controlled. This is a great supplement for all kids, all throughout childhood. - It's okay to give them the capsules too? - It's okay to give the capsules. For kids who won't swallow the capsules yet, you could do the liquid cod liver oil. It comes in flavors, but what I would do is as early as possible, get them started on the plain unflavored, and if you don't make a big deal out of it, if you don't make a face over it and they're very young, you are in charge of shaping their palate. You can just introduce it even into their milk, as soon as they've been cleared by the pediatrician to eat fish, you can start introducing fish oil. You just put that into their milk or give them a teaspoon of it, and you're set for life. - Can you mix it in a smoothie? - You can also mix it into a smoothie, yes. - I really learned a lot today. This was super interesting. What is the GAPS diet and how can it benefit families?